When I first heard that Downton Abbey: The Exhibition was coming to New York, I was beyond excited! It has been years since the last season aired. Nothing could quite replace witty, funny quotes of Dowager Countess, the fascinating-to-watch competition between Mary and “poor Edith”, blossoming romances, emotional heartbreaks and seemingly never-ending miseries of upstairs and downstairs habitants of Downton Abbey. Asking myself the iconic “What is a weekend?”, I decided to take my friend Allison, a fellow fiction writer and another die-hard Downton Abbey fan, to the exhibition on Saturday morning to explore and review it for my Pastiche.today readers. I already had a Downton Abbey theme running on my blog, and I knew that this experience will be a perfect addition to the collection of my articles about the show and looks inspired by the Downton Abbey’s characters. You can click here to see the rest of the posts inspired by the famous PBS show. From the very beginning, the exhibition immerses you into the Crawleys’ household and really makes you feel that you are stepping into the Highclere Castle, where the PBS show was filmed. It all starts with the warm welcome from Carson and Mrs Hughes, and leads you through an impeccably and very true-to-detail executed kitchen of Mrs. Patmore, where she ruled over a handful of kitchen maids and footmen. Then you continue to explore the detailed sets and costumes of the servants’ quarters. The second and the third floor explores the lavish and beautiful world of Crawleys. It felt almost scandalous to peek at immaculately recreated Lady Mary’s bedroom, where I couldn’t help to avoid thinking of Kemal Pamuk. Then there is of course a grand dining room. Empty, but all set for an exquisite dinner party that could arrive any second. Every detail is intimately familiar and gives such a surreal feeling of invading Crawleys’ home that I half expected the Dowager Countess Violet to appear in front of me with a suppressed, but visible mark of a humorous disdain on her glorious face: “Oh, roll up, roll up, visit an actual dining room! Complete with a real life table and chairs!”. Slowly walking and taking in all the magnificence of the masterfully designed space by Imagine Exhibtions, Allison and I especially enjoyed all the interactive and smartly placed insights of the historic events and changes that occurred in daily lives of British subjects from Post-Edwardian Era to the World War 1 and the Roaring Twenties. I can confidently and sincerely declare that even those who haven’t yet seen the Downton Abbey would enjoy all the valuable and entertaining information if they have even a remote interest in history! And how can I forget to mention the costumes and accessories of the Downton Abbey’s ladies and gentlemen! The abundance of wedding laces, strict lines of riding costumes and enchanting glitz of all the glamorous 20s gowns absolutely stole my heart. Even though sometimes I like slipping into pajamas at a Netflix kind of night at home, I desperately long for the times when an afternoon tea in a garden required a pretty hat, and for a 6 pm dinner you had to change into an evening gown and wear long elegant gloves. 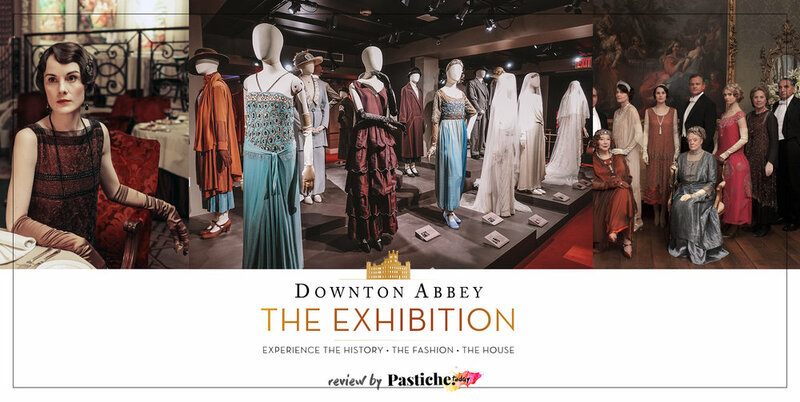 Downton Abbey: The Exhibition has exceeded my expectations and truly made me feel like I was a dear guest at the Crawley’s, or a curious phantom wondering through the halls and sumptuous rooms of the family that quite honestly feels in a way like my own! Week 13: Grace Kelly. Manus X Machina. Fashion in an Age of Technology. Ben and I are loyal National Geographic subscribers, so we were very excited to visit a new attraction at the heart of Times Square - a NatGeo Encounter: Ocean Odyssey. It is a first-of its-kind immersive entertainment experience that lets you to take a plunge into a deep, undersea world and learn about ocean life in a fun and interesting way. I am a certified diver and I can tell that many of the experiences felt like a real dive, minus the getting wet part! National Geographic has created a real game-changing interactive experience that makes me look forward to the future of educational media. Ocean Odyssey is a fast-changing, smart, multi-sensory journey fit for all ages, and includes innovative technologies that will make you gasp in awe. For example, Ben and I really enjoyed the kelp forest maze, and a 3D experience (no spoilers though!) for fun, but we found that the best part was actually learning about the watery part of our beautiful planet in different rooms filled with screens and interactive tools. We never stood still as the journey took us through a beautifully and intricately designed 60,000-square-foot space that offered a variety of different entertainment, educational tools and information. I think this National Geographic Encounter is perfect for kids and will help them understand our oceans and marine life more, planting some fundamental knowledge into their smart, little heads. This knowledge, I believe, will help them to grow considerate and enlighten of the oceans and will help preserve our oceans in the future. Ocean Odyssey is an inspiring journey that will definitely spark the interest of young ones in marine science, environmental change and oceanography. The experience is also great for couples and friends who would love to do something other than drinking at a bar or watching endless stream of TV shows. If you are up for taking a dive into the oceans in the middle of Times Square, BOOK TICKETS here and prepare for some "blue-lit" fun. Week 20: Kauai Island. Adventures with horses, scuba diving and flying high. Oculus, designed by the celebrated Spanish architect Santiago Calatrava, is one of my favourite buildings in New York. The gigantic Transportation Hub, officially called the World Trade Center, evokes a big white bird, spreading its massive steel wings preparing for a flight. Despite the heavy criticism of Calatrava's over-budget and seven years behind the schedule, project, I trust that Oculus represents the new-age grandiosity of New York, like the good old Grand Central embodied New York's pompous ascent at the beginning of the 20th century. To me this $4 billion station is not just “the world’s most expensive train station”, but a new symbol of New York, a reminder that everything is possible in this big beautiful city I am so privileged to call home. Photographs were taken in Oculus, by Dennis Christians. (More posts about Culture and Exhibitions here ). Week 27: The Start of 2017. How to Reach Your Goals! In my A Girl With A Plan post I shared my goals for 2017, and today I am going to write about what helps me stay on track. Hopefully this will be useful to you as well! A girl with a plan? Have I ever been one? Looking back at my life, I think I have always been one of those lucky people who could wing anything and win. In school, I could prepare for a very complicated exam the night before and get the highest grade. During my Master’s degree course at the London College of Communication, I wrote my dissertation and conducted all the necessary interviews, observations and experiments in less than two months, while other student were planning their research for a year. In the end, I was one of very few at the University who got top marks with distinction (A+), and praise for my work. But is it really only luck? Now, having more experience and knowledge of myself, I realise that I am just much more productive when I have a tight deadline. I always complete my tasks on time, and I try to produce the best work I can in the shortest amount of time, no matter what it takes. During the last month of my dissertation writing, I did not sleep for days - surviving on coffee mixed with RedBull and pizza deliveries. I had no social life. I read at least ten books on my topic per day and watched videos and Ted Talks about my subject. I was totally immersed in the process. The same happened to me with my editorial job with Wedding Magazine: The last week before an issue went to the printers, I would sleep with my laptop, a highlighter in my hand and an ocean of printed design mockups and articles that needed to be edited. Tip #1: Give yourself DEADLINES. Have small tasks for every single day and bigger ones for the month, or even the year. Make sure that your daily ‘To-do List’ contributes to your bigger yearly goals. If you want to write a 50,000 word novel in a year, then make sure you write 1000 words every Monday, for example. Having an agenda keeps me focused on my dreams and major goals, while still helping me get through everyday life. I also strongly recommend writing down pleasant things you have to do as well. For example: ‘Meet up with a friend at 6 pm’ or ‘Find the perfect dress for my opera night date.’ You get the idea, right? I also have a little, digital helper, the Do-It-Tomorrow app. I fail to use it regularly because I am more of an analog type of person, but I know many people who prefer using apps over paper notebooks. The app is very straightforward and easy to use, and has a very simple, pretty design. I have linked to the notebook that I absolutely love (I got this gorgeous pink Agenda from my husband this Christmas!) and apps that will help you plan your day and reach your goals. TIP #2: FIND YOUR OWN WORKSPACE AND TIME. If you are a freelancer, a blogger or a writer like me, finding your workspace can be incredibly hard. Working from home might sound great, but it can be disastrous if you cannot separate your lounging time from work time. Make sure you set strict hours of work for yourself and stick to them regardless of whether or not there is a new episode of The Bachelor waiting to be streamed or a welcoming bed ready for you to plunge into any time of the day. If it is hard not to be distracted when working at home. Make yourself a little ‘office corner’ and sit there only when you are actually working. No Facebook scrolling, no binge watching Netflix. If that does not work, find a café near you. I find the Starbucks in NYC to be too loud and too small compared to a my favourite ones in London (how awesome is the one on Regent’s street? ), but luckily there are many many places in Manhattan with free Wi-Fi and delicious treats. I love Macarons Cafe on Lexington Ave and Mari Vanna on weekday afternoons for writing. TIP #3: HIGHLIGHTERS & BOOKMARKS. Sounds like a weird tip, but highlighters and bookmarks make my life so much easier. Highlighting an interesting passage in a book, bookmarking an inspiring photograph in a magazine or just underlining an important meeting in your agenda with a coloured pen helps me to get the most out of my learning and growing as an individual. Pinterest is not only about saving pretty photos and illustrations. I have about fifty secret boards on Pinterest that only I can see. For example, before I visit a new travel destination, I research it on Pinterest. I pin the most interesting places in the city, travel articles I find online, travel guides that I might want to buy on Amazon, cute illustrated maps of the city, and even outfits I would like to buy for that destination. I have Pinterest boards that link to useful articles on Writing, Blogging Ideas, Photoshop Tutorials and so on. Because these boards are secret, I have total freedom of what to pin, prioritising usefulness over the aesthetic beauty of the board. To help you, I made one of my secret boards from our ‘Scandinavian Adventure’ public, so you can see what I am talking about. Follow Ulia's boards on Pinterest. These are my main tools that help me achieve my goals, and hopefully these tips will be useful to you too. And remember, it is easy to make New Year’s resolutions, but without a proper daily plan, you will run out of enthusiasm and results before Valentine’s Day. Treat every single day as a step towards a better, more accomplished you, and do not put tasks away for later. Do you remember the latest MET Gala? The MET Galas are traditionally held to celebrate and support fabulous new exhibitions at the Metropolitan Museum. 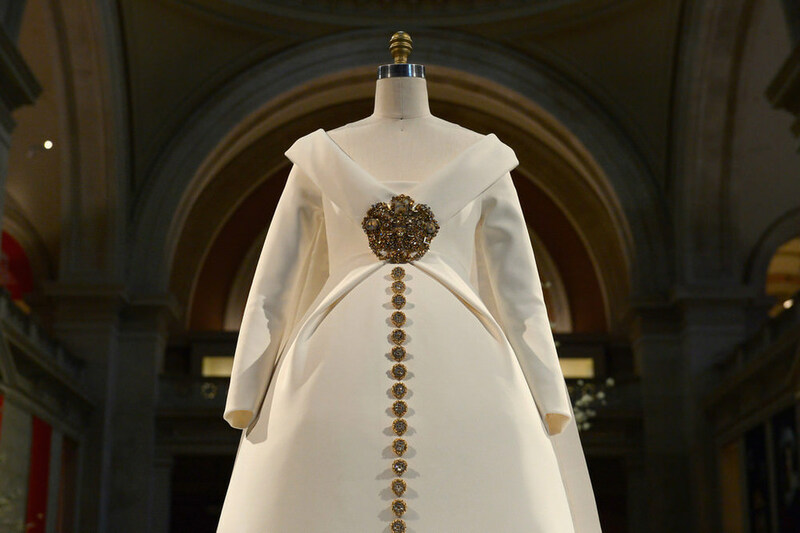 This year’s celebrated exhibit is Manus X Machina: Fashion in an Age of Technology. The exhibition explores the marriage between technology and fashion, showcasing astonishing creations by the most famous fashion designers which illustrate the perfect symbiosis of complicated handmade pieces with machine work. The exhibition is open at the Met Fifth Avenue through August 14, and I strongly recommend you see it. From the moment you step in you will feel a grandness and sacredness of the place, the kind that you experience in lavish medieval cathedrals or mosques. The circular exhibition space beckons us to look into its numerous alcoves with couture creations which are placed on pedestals like sculptures of Saints. The dimly lit museum wing is haunted by beautiful soul-reaching melodies. Only the fashion artifacts are magically lit, attracting your gaze. Despite the spellbound crowd with their iPhones glued in hand, the experience is almost mystical and pilgrimatic. Find all hope - You Who Enter Here should be written before the entrance, because Manus x Machina will leave you inspired. The centerpiece of the exhibition is this exquisite Chanel gown created by Karl Lagerfeld. This dress's meters-long train sparkles like a gilded altarpiece. This dress— made of a synthetic fabric called scuba knit— was hand-molded, machine-sewn, and then hand-finished, with intricate embroidery in pearls and gemstones forming a glittering baroque pattern. Why have I decided to include this exhibit in my Grace Kelly Week? Because I believe some of these gorgeous pieces could have easily been worn by Grace. 50s silhouettes are definitely my favourite! If the Devil wears Prada, Demons certainly wear Alexander McQueen. Fabulous handmade Chanel gown from Fall/Winter 2005 Haute Couture collection. I call these the hedgehog-dresses. The famous Yves Saint Laurent dress known as "Sardine" is even more stunning in real life. The photograph cannot reflect how brilliantly the "fish skin effect" was created. It is mesmerising. I hope you enjoyed the post! Let me know if you would like to see more exhibition reviews or want me to attend and photograph a certain event/show for you.